Why pay for Final Cut Express when iMovie is free? A couple years ago, I wrote about my then-recent move from iMovie '08 ( ) to Final Cut Express 4 ( ), mainly due to the total makeover that version of iMovie had just received. After two years and countless videos, I’ve learned a lot about Final Cut Express, though my knowledge still barely scratches the surface of what this program can do. During this time, I’ve occasionally experimented with returning to another updated version of iMovie ( ), primarily due to its ease of use. Every time I tried, though, I found myself going back to Final Cut Express. Whenever this happened, I tried to figure out why. At first, I thought it was features—there’s no doubt that Final Cut Express is a more powerful program. But that’s not it—for my editing needs, iMovie provides nearly everything I’d ever want or need in the way of features, though it is nice having all that power available. The more I thought about it, the more I realized there's one thing that keeps me away: the interface. iMovie’s user interface is unlike anything I’ve ever seen in any other video editing package. Whenever I try to use iMovie, I find its interface constantly interferes with my ability to actually get anything done. Sometimes different is good, but sometimes, different is just different. What exactly bothers me? My biggest problem with iMovie is its reliance on thumbnail images for editing work. In iMovie, all clips for a project go into a clip bin, which displays thumbnail stills from various points in each video clip. My first complaint is the thumbnails themselves—are these really supposed to help me figure out exactly what piece of the video I want to use? Depending on what you’re shooting, they are next to worthless. Each clip is separated by a narrow gap, which is sometimes located at the end of a row in the bin, making it nearly impossible to see. Selecting a segment of a clip requires using a mouse-drag to highlight the area of the clip you’d like to use; I find this quite imprecise and spend a lot of time dragging back-and-forth until the selection is just right. In order to have thumbnail images of a reasonable size, the clip bin is quite large. Despite with its size, it still takes a lot of scrolling to see everything if your project has more than two or three clips of even a modest length—in the image I used, only two clips are visible. iMovie’s timeline uses this exact same layout, which again means a ton of scrolling up and down if you want to move through your assembled movie. The use of thumbnails might be bearable if it weren’t for the behavior of the mouse pointer in the bin and timeline. In iMovie, the mouse pointer seems to be a living, breathing entity…and I want nothing more than to crush the life out of that poor defenseless arrow. If you so much as bump your mouse in iMovie, many bad things can happen. The large preview area will play the video frames between where the mouse was and where it now is…and even worse, it will also play any audio that’s in those video clips as the mouse moves. (This, thankfully, can be disabled, though the video preview playback cannot.) If you happen to click the mouse button, and you had a selection made in the clip bin…well, sorry, but it’s gone now. Something else that I run into all the time is that, after positioning the mouse just so for a frame I want to look at, I’ll have to switch applications to do something else…which means, of course, that I need to move the mouse. End of selection; I get back from my other program, and I have to start all over. No thumbnails and a dead mouse! Contrast this with Final Cut Express, where, first of all, the mouse is thankfully not a living entity—nothing in any of its windows changes with mouse movement; only when you press Play or click-and-drag the mouse will your screen change. 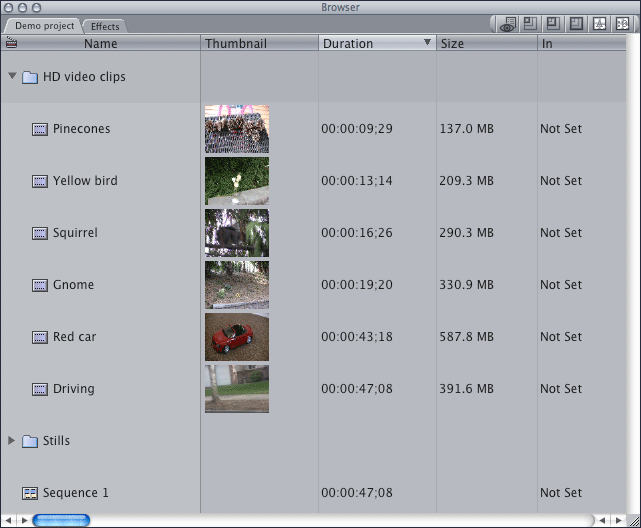 In Final Cut Express, clips are identified not by an endless string of thumbnails, but by a user-defined name, along with an optional single thumbnail. With a well-chosen name and a thumbnail, I know at a glance exactly what’s in each clip in my bin. If I do need to see a clip in detail, I can double-click any clip, which will open it on the canvas. The canvas is a sort of work area where you can make changes and add filters to your clip, but not put it into the project. There’s nothing like this in iMovie; you either view a clip in the clip bin, or work with it in the timeline. The timeline in Final Cut Express is a true timeline, where video clips are shown over a time scale, and laid out end to end, making it easy to visually see exactly how your project is growing. You can also change the scale (as you can in iMovie) to really work on the details. In Final Cut Express, though, you can really zoom in, making it easy to work on tight edits. But the biggest difference between the timelines is just how easy it is to see exactly what your project looks like in Final Cut Express—contrast the two images below for an example of those differences. The top image is the iMovie timeline; the bottom is from Final Cut Express. iMovie (top) and Final Cut Express (bottom) use very different timelines (click for larger view). In the iMovie timeline, only five of the six clips are fully visible, and there’s absolutely no sense of time in the timeline, other than knowing the total length of the project. In the Final Cut Express timeline, the clips are clearly laid out over a time line, so you can not only see total time, but also the duration of each clip. You can also see all six clips in full, and the entire timeline takes up much less room than does that of iMovie. 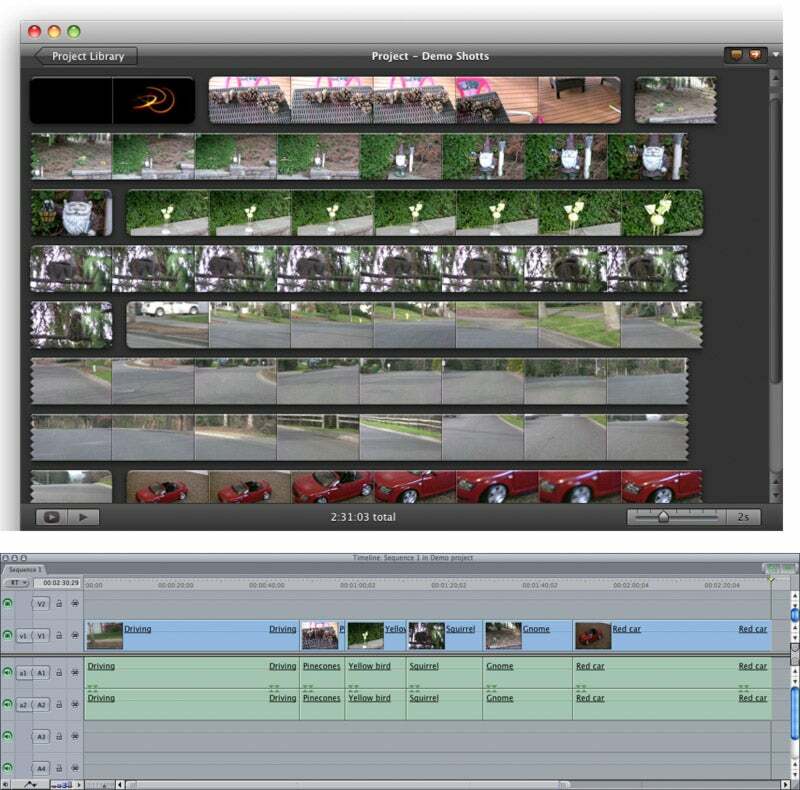 When working on video projects, the Final Cut Express interface is just a much more efficient way to get things done. Moving up from iMovie to Final Cut Express isn’t an easy decision—Final Cut Express costs $200, while iMovie is free with every new Mac, or $79 as part of iLife. So is it worth it? If your video editing consists of nothing more than the occasional edit of a 45-second clip recorded on your digital camera, then probably not. But if you work on longer projects, or want access to a wider array of features (including third-party plug-ins), then Final Cut Express is well worth the investment. It may not be free, but the timesaving interface makes it money well spent in my book.